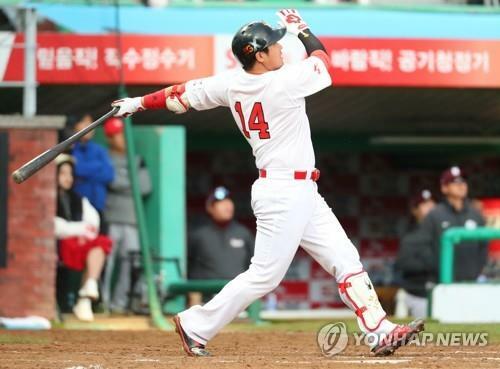 SEOUL, Nov. 20 (Yonhap) — MVP candidate Yang Eui-ji and slugger Choi Jeong are among 15 players to hit the open market in South Korean baseball this winter. The Korea Baseball Organization (KBO) announced a list of players who have elected for free agency. Last weekend, the KBO said 22 players were eligible, and 15 chose to exercise their rights. The length of the KBO season went from 128 to 144 games in 2015, with the addition of a 10th club, the KT Wiz. Players will also qualify for a full season if they’ve remained on the active roster for at least 145 days within a year. 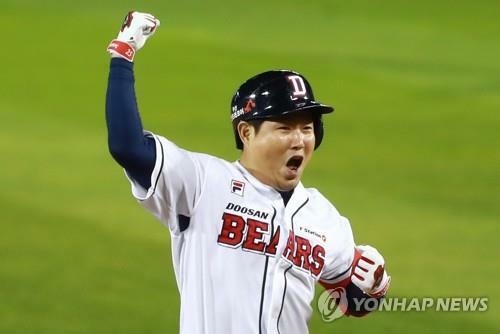 Yang, a veteran catcher for the Doosan Bears, is one of the biggest names in this year’s free agency. Yang appeared in just three games in 2007 and then completed his mandatory military service before returning for his first full season in 2010. He hit 20 homers and drove in 68 runs to win the Rookie of the Year award that season. The 31-year-old has since developed into the KBO’s most complete catcher — an accomplished game caller and defender who can also hit for power and average. Yang has launched 20 or more home runs four times, including a career-high 23 in 2018. The career .299 hitter batted .358 to rank second in the league this year, and he finished fourth in the MVP voting Monday. He made 600 million won (US$532,250) this season. Choi, who’s patrolled the hot corner for the SK Wyverns since 2005, is a free agent for the second time. After the 2014 season, Choi signed a four-year deal worth 8.6 billion won, the most lucrative free agent contract in the KBO history at the time. Choi won back-to-back home run titles in 2016 and 2017 with 40 and 46 homers, and he followed that up with 35 homers this year while being limited to 115 games due to injuries. No one has hit more home runs than Choi’s 121 over the past three years. The 31-year-old is second among active players and ninth all-time with 306 career home runs. Choi’s SK teammate, catcher Lee Jae-won, is also a free agent. The Wyverns captain batted .329 with 17 home runs and 57 RBIs while providing stability behind the plate. He made 350 million won this year and is expected to get a hefty raise, regardless of where he ends up.